GitHub can handle building your Jekyll site without the need of Forestry or a CI tool. GitHub will build your Jekyll site each time a new commit is pushed to GitHub and serve it automatically. 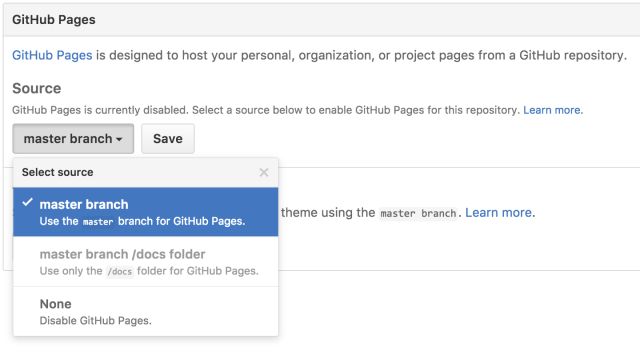 When using GitHub to build your GitHub Pages site, you are restricted to using the white-listed GitHub Pages Jekyll version and plugins. Next, head over to the Settings page of your repository in GitHub, and scroll down to GitHub Pages. Set the Source option to “master branch” and click Save. Note the URL listed at the top of the GitHub Pages settings. This is the URL that your GitHub Pages site will be served from. Lastly, in Forestry navigate to the Settings page, click the Hosting tab, and set the Connection option to Commit to source repo only. Your Jekyll site will now be re-built by GitHub each time a commit is pushed to your repository. Your _config.yml file must reside in the root of your repository for GitHub Pages to build your site.